13 Is healing frightening? To many, yes. For accusation is a bar to love, and damaged bodies are accusers. They stand firmly in the way of trust and peace, proclaiming that the frail can have no trust and that the damaged have no grounds for peace. Who has been injured by his brother and could love and trust him still? He has attacked and will attack again. Protect him not, because your damaged body shows that you must be protected from him. To forgive may be an act of charity, but not his due. He may be pitied for his guilt, but not exonerated. And if you forgive him his transgressions, you but add to all the guilt that he has really earned. 14 The unhealed cannot pardon. For they are the witnesses that pardon is unfair. They would retain the consequences of the guilt they overlook. Yet no one can forgive a sin which he believes is real. And what has consequences must be real because what it has done is there to see. Forgiveness is not pity which but seeks to pardon what it knows to be the truth. Good cannot be returned for evil, for forgiveness does not first establish sin and then forgive it. Who can say and mean, "My brother, you have injured me, and yet because I am the better of the two, I pardon you my hurt." His pardon and your hurt cannot exist together. One denies the other and must make it false. 15 To witness sin and yet forgive it is a paradox which reason cannot see. For it maintains what has been done to you deserves no pardon. And by giving it, you grant your brother mercy but retain the proof he is not really innocent. The sick remain accusers. They cannot forgive their brothers and themselves as well. For no one in whom true forgiveness reigns can suffer. He holds not the proof of sin before his brother's eyes. And thus he must have overlooked it and removed it from his own. Forgiveness cannot be for one and not the other. Who forgives is healed. And in his healing lies the proof that he has truly pardoned and retains no trace of condemnation that he still would hold against himself or any living thing. 16 Forgiveness is not real unless it brings a healing to your brother and yourself. You must attest his sins had no effect on you to demonstrate they were not real. How else could he be guiltless? And how could his innocence be justified unless his sins have no effect to warrant guilt? Sins are beyond forgiveness just because they would entail effects which cannot be undone and overlooked entirely. In their undoing lies the proof that they were merely errors. Let yourself be healed that you may be forgiving, offering salvation to your brother and yourself. A broken body shows the mind has not been healed. A miracle of healing proves that separation is without effect. What you would prove to him, you will believe. The power of witness comes from your belief. And everything you say or do or think but testifies to what you teach to him. 17 Your body can be means to teach that it has never suffered pain because of him. And in its healing can it offer him mute testimony of his innocence. It is this testimony which can speak with power greater than a thousand tongues. For here is his forgiveness proved to him. A miracle can offer nothing less to him than it has given unto you. So does your healing show your mind is healed and has forgiven what he did not do. And so is he convinced his innocence was never lost and healed along with you. 18 Thus does the miracle undo all things the world attests can never be undone. And hopelessness and death must disappear before the ancient clarion call of life. This call has power far beyond the weak and miserable cry of death and guilt. The ancient calling of the Father to His Son, and of the Son unto his own, will yet be the last trumpet that the world will ever hear. Brother, there is no death. And this you learn when you but wish to show your brother that you had no hurt of him. He thinks your blood is on his hands, and so he stands condemned. Yet it is given you to show him by your healing that his guilt is but the fabric of a senseless dream. 19 How just are miracles! For they bestow an equal gift of full deliverance from guilt upon your brother and yourself. Your healing saves him pain as well as you, and you are healed because you wished him well. This is the law the miracle obeys; that healing sees no specialness at all. It does not come from pity but from love. And love would prove all suffering is but a vain imagining, a foolish wish with no effects. Your health is a result of your desire to see your brother with no blood upon his hands nor guilt upon his heart made heavy with the proof of sin. And what you wish is given you to see. 20 The "cost" of your serenity is his. 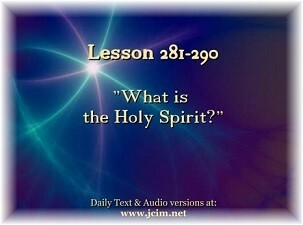 This is the "price" the Holy Spirit and the world interpret differently. The world perceives it as a statement of the "fact" that your salvation sacrifices his. The Holy Spirit knows your healing is the witness unto his and cannot be apart from his at all. As long as he consents to suffer, you will be unhealed. Yet you can show him that his suffering is purposeless and wholly without cause. Show him your healing, and he will consent no more to suffer. For his innocence has been established in your sight and his. And laughter will replace your sighs because God's Son remembered that he is God's Son. 21 Who then fears healing? Only those to whom their brother's sacrifice and pain are seen to represent their own serenity. Their helplessness and weakness represent the grounds on which they justify his pain. The constant sting of guilt he suffers serves to prove that he is slave but they are free. The constant pain they suffer demonstrates that they are free because they hold him bound. And sickness is desired to prevent a shift of balance in the sacrifice. How could the Holy Spirit be deterred an instant, even less, to reason with an argument for sickness such as this? And need your healing be delayed because you pause to listen to insanity? 22 [Correction is not your function. It belongs to One Who knows of fairness, not of guilt. If you assume correction's role, you lose the function of forgiveness. No one can forgive until he learns correction is but to forgive and never to accuse. Alone, you cannot see they are the same, and therefore is correction not of you. Identity and function are the same, and by your function do you know yourself. And thus, if you confuse your function with the function of Another, you must be confused about yourself and who you are. What is the separation but a wish to take God's function from Him and deny that it is His? Yet if it is not His, it is not yours , for you must lose what you would take away. 23 [In a split mind, identity must seem to be divided. Nor can anyone perceive a function unified which has conflicting purposes and different ends. Correction, to a mind so split, must be a way to punish sins you think are yours in someone else. And thus does he become your victim, not your brother, different from you in that he is more guilty, thus in need of your correction as the one more innocent than he. This splits his function off from yours and gives you both a different role. And so you cannot be perceived as one and, with a single function, that would mean a shared identity with but one end. 25 Consider how this self perception must extend, and do not overlook the fact that every thought extends because that is its purpose, being what it really is. From an idea of self as two, there comes a necessary view of function split between the two. And what you would correct is only half the error, which you think is all of it. Your brother's sins become the central target for correction, lest your errors and his own be seen as one. Yours are mistakes, but his are sins and not the same as yours. His merit punishment, while yours in fairness should be overlooked. 26 In this interpretation of correction, your own mistakes you will not even see. The focus of correction has been placed outside yourself on one who cannot be a part of you while this perception lasts. What is condemned can never be returned to its accuser, who hated it and hates it still. This is your brother, focus of your hate, unworthy to be part of you and thus outside yourself—the other half which is denied. And only what is left without his presence is perceived as all of you. To this remaining half the Holy Spirit must represent the other half until you recognize it is the other half. And this He does by giving both of you a function that is one, not different. 27 Correction is the function given both , but neither one alone. And when it is fulfilled as shared , it must correct mistakes in both of you. It cannot leave mistakes in one unhealed and set the other free. That is divided purpose which cannot be shared, and so it cannot be the function which the Holy Spirit sees as His. And you can rest assured that He will not fulfill a function He cannot understand and recognize as His. For only thus can He keep yours preserved intact, despite your separate views of what your function is. If He upheld divided function, you were lost indeed. His inability to see His goal divided and distinct for each of you preserves your Self from being made aware of any function other than Its own. And thus is healing given both of you. 28 Correction must be left to One Who knows correction and forgiveness are the same. With half a mind, this is not understood. Leave then correction to the Mind that is united, functioning as one because It is not split in purpose, and conceives a single function as Its only one. Here is the function given It conceived to be Its own and not apart from that Its Giver keeps because it has been shared. In His acceptance of this function lies the means whereby your mind is unified. His single purpose unifies the halves of you which you perceive as separate. And each forgives the other, that he may accept his other half as part of him. Let me forget my brother's past today. 1 This is the thought that leads the way to You and brings me to my goal. I cannot come to You without my brother. And to know my Source, I first must recognize what You created one with me. My brother's is the hand that leads me on the way to You. His sins are in the past along with mine. And I am saved because the past is gone. Let me not cherish it within my heart or I will lose the way to walk to You. My brother is my savior. Let me not attack the savior You have given me. But let me honor him who bears Your Name and so remember that It is my own. 2 Forgive me, then, today. And you will know you have forgiven me if you behold your brother in the light of holiness. He cannot be less holy than can I, and you cannot be holier than he. Before commenting on this Lesson, I just want to say how perfect and timely every Lesson is that shows up in our day. Yesterday, we watched the movie, The Words , which was all about believing that we must somehow atone for our past sins. The movie was helpful in having us look at how we hold the belief in our minds that there are real consequences for what we have done. It was about making the error real, and now we must pay for our sins. The reality is that we are innocent now. Nothing we have done in the past has actually happened. There was also an amazing scene that brought to my mind the importance of being led by inspiration in what we do in the world. The author of the manuscript had tried and tried to write, but when events in his life conspired to bring about a moment of inspiration, the words literally wrote themselves. When we do anything with the ego, it is such a grind, but following inspiration creates a beautiful flow. It does not matter what we are doing. Life simply moves through us, whether we feel inspired in one moment to clean the house or to write a book. To be inspired is to follow the guidance of Spirit and simply let it come through us, and then everything is done with ease. In this Lesson, I am reminded that "I cannot come to You without my brother." (W.288.1.2) We are recognizing our Oneness with every brother. We have a shared identity and salvation lies in this recognition. If the problem is separation, the answer must be to join. How can we know that we are joined if we hold grievances, judgments, and comparisons of any kind and see ourselves different from our brothers? We must let go of the desire to benefit at their expense. Our sense of specialness makes demands of others. From our perspective, specialness requires others to recognize and acknowledge our needs. Our needs take primacy over those of others. We see ourselves as the center of our universe and everyone must take note. Thus, we use our brothers for the purpose of supporting our fragile egos rather than for joining and seeing sameness and equality. The way we join is through forgiveness of our perceived differences and mistaken perceptions. We forgive our projections of the sins we put onto our brothers. They become the depositories of our self-condemnation, which is why we do not want to be like them. We don't like what we see in them, but what do we see except our own projected sins that are the shadow side of our self-concepts that we have kept hidden. As these are healed, our relationships are healed and thus space is made to join with our brother as a reflection of the Oneness we share. Another movie called, Samsara , is about a monk who believes he has to make a choice between the wife and child he loves or his life in the monastery. From a Course perspective, we are not called to sacrifice our relationships. On the contrary, the way given us in this Course is to do the healing through relationships. Such a choice, as presented in the movie, is not required. Our special relationships, when given over to the Holy Spirit for His use, are transformed to holy relationships and become our greatest opportunity for healing. Jesus tells us that the transformation process may initially be very conflicted and tumultuous when the goal for the relationship is changed, but we can trust that there is significant discomfort only during the time of transition, and it is only there as long as we stay in resistance. The process is certainly uncomfortable for the ego but delightful to the spirit. I experienced such a situation in my "special" relationship quite a few years ago; and I can say unequivocally that when the goal was changed, I experienced tremendous turmoil, which required a lot of trust in the Holy Spirit that His promises would be kept. "When you have made this joining as the Holy Spirit bids you, and have offered it to Him to use as He sees fit, His natural perception of your gift enables Him to understand it, and you to use His understanding on your behalf." (T.16.II.4.4) (ACIM OE T.16.III.13) We don't need to understand it. We just need to rely on His understanding. What motivates awakening is the pain of our specialness. When we ask for the healing, the goal will be shifted from specialness to holiness. Yet there will be some sense of disillusionment before we are ready to find a better way. When all of our ego strategies fail, we become much more willing to undertake the healing. Those periods of disillusionment in our lives don't seem like gifts to us, but they can be the times of our greatest spiritual progress when we choose to turn to His understanding and not our own. Our part is to ask with sincerity and willingness. To know God requires the undoing of the self that we think we are, and that is where the resistance comes in. We value our individuality, uniqueness, and specialness, which are all aspects of the false self that we have made as a result of our choice to separate from God and hide in the body and the world. Now we want to preserve this separate self, even though it hurts. The cost to us is that we no longer know who we truly are as the Christ Self. The dissolution of the ego through forgiveness, and with it the recognition of our true identity as Spirit, leads us out of separation, but it is a process in which we experience fear and thus there is resistance. Daily, we see crimes, acts of violence, and misbehaviors, but with the healing of our guilt, we will increasingly see all such behaviors as deep calls for love and understanding. Until then, all we are called to do is take responsibility for the desire to see guilt in our brothers and recognize it is projected from our own minds as a result of our unconscious self-hatred. Each time we are willing to take responsibility for our projections and ask for healing, the separation is being undone, and there is increasing recognition of our sameness. "And where, you wonder, does your strange uneasiness, your sense of being disconnected, and your haunting fear of lack of meaning in yourself arise?" (T.22.I.1.6) (ACIM OE T.22.II.5) As this Lesson reminds us, we need to do the healing work with our brothers so we will see that there are no differences, and we are indeed One. When forgiveness is complete, we see that the disconnection we feel with everyone is a defense against the truth of what we are. When our defenses are released, we see "My brother's is the hand that leads me on the way to You." (W.288.1.4) We do this, according to Jesus, by recognizing our sameness, rather than comparing ourselves with others and seeing ourselves as superior. Sameness is just a reflection of Oneness. For years, I had a difficult relationship with my sister, who is eleven months younger than me. Our animosity continued for most of our lives. Jesus says it takes only one of us to heal a relationship since, in reality, there is only one of us. When I was in Sedona, I worked on releasing my grievances. One day at an Interfaith Service, we sang the words: "I cannot go without you, for you're a part of me. So take my hand, my sister. And go to God with me." As I sang these words, the tears flowed, and I knew the years of struggle between us were dissolved. I had let go of the past by turning over my grievances to the Holy Spirit. There was no longer a past. There was only this beautiful present moment of joining. There was only the power of now , as Eckhart Tolle would say. And in this present moment, through the holy instant, salvation was given. The past was gone! It truly was a miracle. "A dream of judgment came into the mind that God created perfect as Himself. And in that dream was Heaven changed to hell, and God made enemy unto His Son. How can God's Son awaken from the dream? It is a dream of judgment. So must he judge not, and he will waken." (T.29.IX.2.1-5) (ACIM OE T.29.X.61) It was my addiction to judgment, based on my stories of the past, that kept this relationship stuck in separation. The ego was preserving the story of our relationship as a means of trapping me in time. "The past is the ego's chief learning device, for it is in the past that you learned to define your own needs and acquired methods for meeting them on your own terms." (T. 15.V.2.1) (ACIM OE T.15.VI.46) In the past, we decided that certain people could make us feel more special than others. Once we learned that some made us "happier" than others, we sought out those kinds of people. They remind us of past sources of love and are, as the Course calls them, "shadow figures" or fantasy images in our minds. They remind us of someone from the past who continues to live in our minds. In fact, we continue to have mental dialogues with them. We desperately want to heal the wounds of the past, but the past is gone and cannot be changed. Forgiveness is giving up the wish that the past should have been different than it was. Until we forgive the past, we continue to try to bring it into the present so we might re-enact it. This time, however, we hope to change the ending, which we imagine might be a happy one. We are the hero of our own play and try to work the script out so that we will get the love and recognition denied us the first time around. The intent behind this play is that all injustices be rectified and all wrongs made right so we can be redeemed. We want to do this in order to demonstrate that the shadow figures were wrong about us! This is the process prevalent in all our special relationships, whether we are conscious of it or not. Of course, it cannot work. It is actually our way of trying to take vengeance on the past and strategizing how others can meet our unmet needs of the past in the present. In God's eyes, we are the same. We are all innocent, and each brother, who is given us, offers us one more opportunity to forgive and remember our Oneness. Now we can see him with Christ's vision, totally innocent of all of our sins that we laid upon him. I know it does not look this way to us. It looks like he is guilty of many sins and attacks on us, but he is simply playing out the role perfectly for our awakening, showing us what is unhealed in our own minds and where we are attacking ourselves. Jesus asks for our forgiveness when he says, "Forgive me, then, today. And you will know you have forgiven me if you behold your brother in the light of holiness. He cannot be less holy than can I, and you cannot be holier than he." (W.288.2.2-3) If we hold a grievance against any brother, we are holding a grievance against Jesus. Our love for any brother is our love for Jesus as we are all One. We all share the same nature of innocence and holiness as Jesus himself, and in our Oneness, no one can be seen as guilty without seeing the whole Sonship as guilty. I find it valuable to try to think of everyone I meet as being Jesus in all his many disguises with no one holier than anyone else. We are all the same. Today, let us remember that anything we perceive in a brother or sister, we are perceiving in ourselves. Any limitations we place on them, we are putting on ourselves. Any doubts we have about their commitment, sincerity, and honesty are doubts we hold first about ourselves. We need to ask ourselves if we want to hurt ourselves in this way. Our goal is to translate all of our special relationships into holy relationships. In fact, they already are, even though, at a conscious level, we don't realize it. Separate interests lead to competing goals. In order to transcend our separate egos and to join in Oneness, we need to invest in recognizing our common purpose. "Only a purpose unifies, and those who share a purpose have a mind as one." (T.23.IV.7.4) (ACIM OT T.23.V.53) "What shares a common purpose is the same. This is the law of purpose, which unites all those who share in it within itself." (T.27.VI.1.5-6) (T.27.VII.54) Thus, when we commit to waking up, we share this purpose with everyone since there is just One Mind. The benefit of our healing will be shared by the entire Sonship.